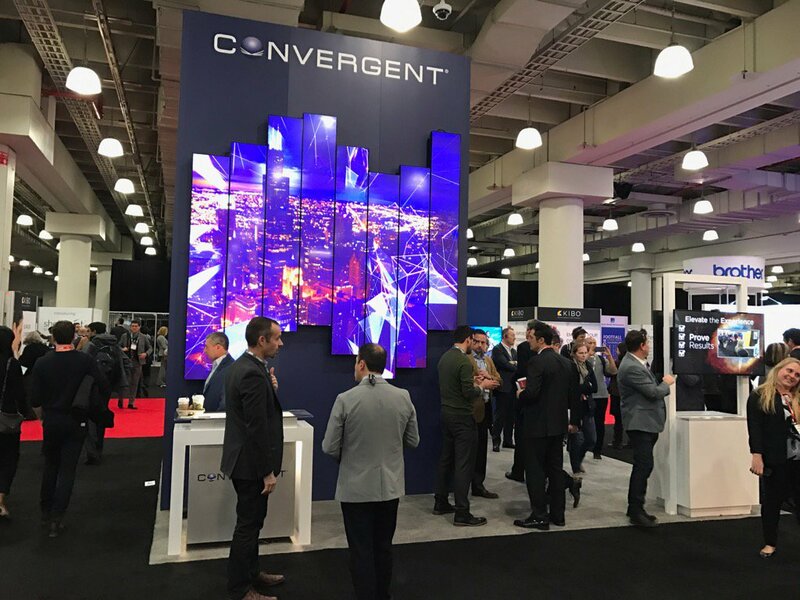 I’m back from retail’s Big Show — last week’s NRF convention and expo in New York City, which hosted nearly 35,000 attendees, offered hundreds of sessions and showcased miles of retail technology, including Convergent’s digital signage capabilities. We were one of only a handful of digital signage providers with a booth, so we were busy with meetings and visits and made a lot of great contacts, all having something interesting to say about the industry in general and their businesses in particular. Here’s a taste of what we saw and heard while we were there. In the wake of store closings both announced and underway at major retailers such as Macy’s, Sears, Kmart and CVS, the disruption of the retail industry was very much on people’s minds at the show. The retailers we spoke with are struggling with the buyer journey, customer expectations and how both are changing with real-time retailing. They feel like they’re behind the eight ball, or about to be, and that’s a scary and intimidating position for them to be in. Given that context, NRF cemented our belief that our DSaaS solution is right on target for retailers. It can change as a retailer’s business changes, and there’s much to be said for a partner that can keep pace with fluctuating market conditions and technology requirements. I couldn’t agree more with Dave’s assessment of the show, and as a matter of fact, we were one of those companies he mentions. The response to the new measurement dashboard we featured in our booth was tremendous. Visitors interacted with the facial recognition display at the front of the booth (by interacted, I mean a large number of them made faces at it), and then came over to review the results on the dashboard. Vendors are doing a lot of interesting things to measure traffic and show results in the retail environment: heat mapping solutions that can detect the flow of shoppers and store hot spots, for one, and crazy-accurate people-counting technologies for another. Measuring the impact of digital signage doesn’t require as much precision, so I was interested to see how our take on analytics would stack up. The results were positive. We had a lot of people looking at our dashboard with a great deal of interest and heard a lot of positive feedback about it. One of the advantages of an event like NRF is the opportunity it gives us to show off our stuff. After all, we’re in a visual industry, and designing content and displays for a booth is a chance to shine. We loved the way our booth showcased all our capabilities, but the real showstopper was the video wall featured on the outside panel of the structure. We talk all the time about the impact a well-executed video wall can make with retail (and other) clients. Attendees noticed the display and came into the booth because of it, and it’s gratifying to get first-hand confirmation of how successful a great display can be (not that we ever doubted it). Interested in learning more about evaluating the effectiveness of your digital signage? Download 5 Ways to Measure the Impact of Your Digital Signage Solution in Retail. Do Your Customers Know More Than Your Employees?